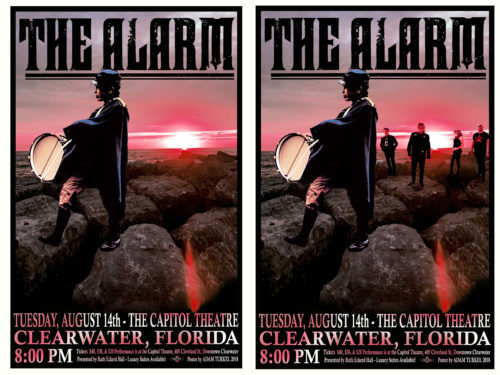 THE ALARM – Clearwater 2018 – Poster by Adam Turkel – Very limited quantity! Very limited quantity available! This is a beautiful 11 x 17 gig poster printed on thick card stock designed by artist, Adam Turkel 2018. This piece was issued to promote Mike Peters and The Alarm’s return to Clearwater, Florida. There are two versions, one with the band and one without…let us know if you have a preference of one over the other! These are beautiful posters that looks stunning framed. If you order 2, you will get one of each! The poster is signed by the artist and numbered or marked A/P as artist’s proofs! Your poster will be mailed flat between heavy cardboard. There were less than 100 of these printed and here’s your chance to score this great original collectible!